Earth hidden safely from mankind. one they will be found. So many people are now being drawn towards crystal skulls. They are becoming very popular and now created in great numbers to support our spiritual development, much needed at this time. The skulls came to me in my dreams, then I started seeing them everywhere. 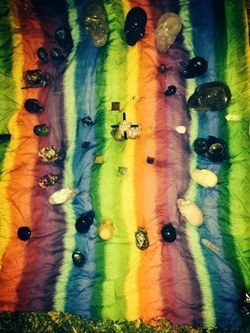 Having always had a thing for crystals and easily connecting with the mineral kingdom. However I was blown away with the connection that I had and got from the Skulls. My skulls talk to me..They show me images and are quite verbal. They are all different, like people and have their own unique energy and wisdom to impart, whilst still maintaining a universal connection to all. If you feel drawn to work with the skulls~ Go for it. They are such an amazing tool to work with. One thing we all have in common is our skull, from what ever region on earth you belong , a human skull is easily identifiable. Its what connects us all. And when we die, we return to bone and our skulls still identify us.